Why do we Tie Rakhi? Sisters tying ‘Rakhi’ on brothers is an age-old Hindu tradition associated with the Rakshabandhan. On this day, the sister ties ‘Rakhi’ on her brother and who pledge to protect her from any danger. Tying of Rakhi is not limited to just brothers and sisters, it has wider dimensions in a multicultural society. But why do we tie Rakhi? Several reasons for this custom are found in the Hindu scriptures, history and folklore. According to Hindu Mythology, the Rakhi tying custom was started primarily to help in the smooth functioning of the society and to instill confidence in the people. The rakhi or raksha used to be tied by a priest after conducting the necessary puja in a temple. The rakhi thus tied used to protect the person from all calamities during the year. And this used to take place in the holy month of Shravan (July – August). A myth in the Bhavishya Purana suggests that Indra who was defeated by the demons in a battle lost all his confidence and arrived depressed at this palace. His wife Sachi, on the advice of her Guru, took a thread and uttered sacred verses of protection and tied it on Indra's hand. Soon Indra overcame his depression and defeated the demons. Another famous myth regarding Raksha Bandhan is associated with Draupadi and Lord Krishna. Lord Krishna used his Sudharshana Chakra to kill Shisupala and in the process injured his finger. All the people present there ran to get a piece of cloth to tie his finger. But Draupadi tore a part of her sari and tied it on the bleeding finger of Krishna. Krishna paid back for that small piece of cloth to Draupadi by elongating the sari that was being disrobed in front of all the people in the Hastinapura court by Dushasana. Another legend involves King Bali and Goddess Lakshmi. The devotion of King Bali brought Lord Vishnu to his palace and Lord Vishnu decided to stay at the palace of Bali. Goddess Lakshmi did not like this and soon followed Lord Vishnu and appeared in front of King Bali. Seeing his devotion, Goddess Lakshmi accepted Bali as her brother and tied a ‘rakhi’ on him. King Bali then asked Goddess Lakshmi to ask anything that she wanted from his kingdom. She demanded the return of Lord Vishnu to Vaikunta. King Bali readily agreed. It is believed that the tying of Rakhi started from this day. Yet another myth involves Yama and his sister Yami or Yamuna. Once Yami was strolling in the Yamaloka and finding her alone ‘Kama’, the god of love, decided to play a prank on her. Kama hit her with his love arrows and soon Yami was sexually aroused. Meanwhile, Yama reached the spot and was perplexed with the incestuous feelings of Yami. Yama soon realized that it was a prank of Kama and asked her to tie a Rakhi on his wrists. Yama told her that he will protect her from all unwanted desires and physical attacks. 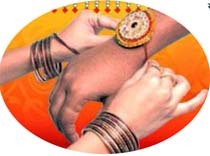 There are numerous other stories and folklore associated with the tying of Rakhi. Two of the legends are part of history and involves Rani Karnawati and Emperor Humayun and Alexander the great and King Puru. It is said that Rani Karnawati sent a Rakhi to Emperor Humayun when her kingdom was attacked by Sultan of Gujarat. Humayun understanding the significance of Rakhi soon came to the help of Rani Karnawati. Alexander failed to defeat the fierce King Puru. Finding her husband’s army in danger, Alexander’s wife, who was aware of the Raksha Bandhan custom, sent a ‘rakhi’ to King Puru. It is said that King Puru accepted her as his sister and refrained from fighting Alexander. If we dig into history, mythology and folklore we will find numerous other reasons for tying Rakhi. But the symbolism is always the same – Rakhi is a symbol of harmony and strength.